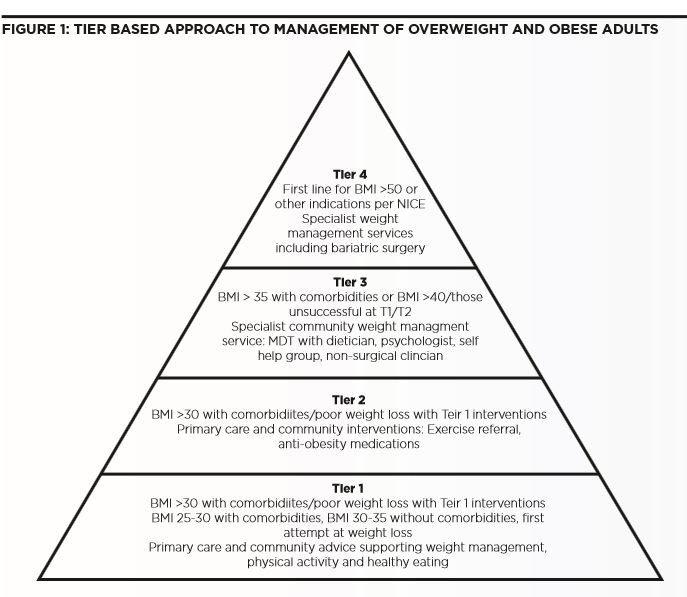 The management of obesity is multifactorial and National Institute for Health and Care Excellence (NICE) recommend a tier based approach (Figure 1). 15 The starting tier is dependent on increasing BMI with or without associated obesity related comorbidities or unsuccessful progress at lower tiers. Tier 1 approach focuses on primary care and community advice to support weight management with guidance on reduction in calorie intake, healthy eating and physical exercise. The second tier of obesity management focuses on community interventions managed by the general practitioner and the community team including exercise prescription. 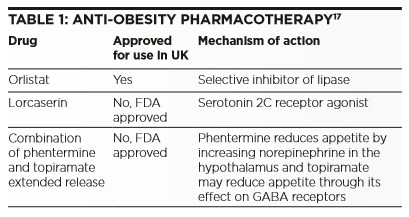 Pharmacotherapy (Table 1) is a further treatment modality which may be considered when patients have not achieved their target weight with the help of diet, exercise and behavioural alterations or are struggling to maintain their weight loss. 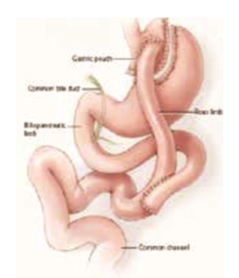 Tier 3 involves referral to a multi-disciplinary specialist weight management service in the community and progression to Tier 4 signifies involvement of secondary care and bariatric surgeons. 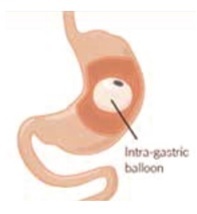 The most commonly performed bariatric procedures worldwide are Roux en y gastric bypass, sleeve gastrectomy, adjustable gastric banding and biliary pancreatic diversion/duodenal switch. 20 Each procedure is associated with impressive long term weight loss and this is measured as percentage of excess weight loss (%EWL) which allows a comparison of the degree of weight loss between patients of varying initial weights 7 (Table2). 1. World Health Organisation. Obesity and overweight. Fact sheet 311. 2014. 2. Health and social care information centre. Statistics on Obesity, Physical activity and diet: England. 2014. 3. Prospective Studies Collaberation. Body-mass index and cause-specific mortality in 900 000 adults: collaborative analyses of 57 prospective studies. Lancet . 2009;373(9669):1083–96. 4. Morgan E, Dent M. The economic burden of obesity Oxford: National Obesity Observatory. 2010. 5. MacPherson K, Marsh T, Brown M. Tackling Obesities : Future Choices – Modelling Future Trends in Obesity and the Impact on Health 2nd Edition. Foresight Programme of the Government Office for Science. London; 2007. 6. Maggard M, Shugarman L, Suttorp M, Maglione M, Sugerman H, Livingston E, et al. Ann Intern Med . 2005;142:547–59. 7. National bariatric surgery data committee. 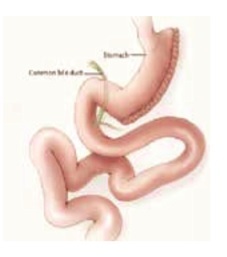 The United Kingdom National Bariatric Surgery Registry: Second Registry Report. 2014. 8. NICE. Obesity : Identification , assessment and management of overweight and obesity in children , young people and adults. 2014. p. 1–70. 9. The Scottish Government. The Scottish Health Survery . 2012. 10. The Welsh Government. The Welsh Health Survey . 2012. 11. Organisation for Economic Co-operation and Development. Health at a Glance . 2013. 12. Picot J, Jones J, Colquitt J, Gospodarevskaya E, Loveman E, Baxter L, et al. Heal Technol Assess . 2009;13:1–190, 215–357, iii – iv. 13. Motta A. Curr Pharm Des . 2012;18(17):2482–91. 14. Vrebosch L, Bel S, Vansant G, Guelinckx I, Devlieger R. Obes Surg . 2012 Oct;22(10):1568–79. 15. NICE. Managing overweight and obesity in adults – lifestyle weight management services. 2014. 16. Guerciolini R. Int J Obes Relat Metab Disord . 1997;21(Suppl 3):S12–23. 17. Bray GA. Best Pract Res Clin Gastroenterol . Elsevier Ltd; 2014 Aug;28(4):665–84. 18. Langer FB, Hoda MAR, Bohdjalian A, Felberbauer FX, Zacherl J, Wenzl E, et al. Obes Surg . 2005;1024–9. 19. Miyazaki Y, Takiguchi S, Seki Y, Kasama K, Takahashi T, Kurokawa Y, et al. World J Surg . 2013 Dec;37(12):2883–90. 20. Buchwald H, Oien DM. 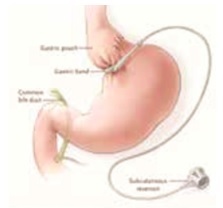 Obes Surg . 2013 Apr;23(4):427–36. 21. Baldry EL, Leeder PC II. Obes Surg . 2014;24(3):416–21. 22. Zerrweck C, Maunoury V, Caiazzo R, Branche J, Dezfoulian G, et al. Obes Surg . 2012;22(5):777–82. 23. Genco A, López-Nava G, Wahlen C, Maselli R, Cipriano M, et al. Obes Surg . 2013;23(4):515–21. 24. Brown W, Korin A, Burton P. Aust Fam Physician . 2009;38(12):972–6. 25. O’Brien PE, MacDonald L, Anderson M, Brennan L, Brown W. Ann Surg . 2013;257(1):87–94. 26. Brown JJS, Boyle M, Mahawar K, Balupuri S, Small PK. Br J Surg . 2013;100:1614–8. 27. Ramos A, Silva A, Ramos M, Canseco E, Galvao-Neto M, et al. ABCD Arq Bras Cir Dig (Sao Paulo) . 2014;27(Supl.1). 28. Frezza E. Surg Today . 2007;37:275–81. 29. Gumbs A, Gagner M, Dakin G, Al E. Obes Surg. 2007;17:962–9. 31. Dixon JB, Brien PEO, Playfair J, Chapman L, Schachter LM, Skinner S, et al. JAMA . 2008;299(3):316–23. 32. Vest AR, Heneghan HM, Agarwal S, Schauer PR, Young JB. Heart . 2012 Dec;98(24):1763–77. 33. Schauer PR, Bhatt DL, Kirwan JP, Wolski K, Brethauer S a, Navaneethan SD, et al. N Engl J Med . 2014;370(21):2002–13. 34. Sjöström L. J Intern Med . 2013;273(3):219–34.